The Kids Trekker Mug is 100 percent leak-proof and spill-proof, to set parents’ minds at ease from worries about drips and stains. Featuring Contigo’s exclusive AUTOSEAL technology, this new product automatically seals between sips and allows children to enjoy their favorite beverages with the simple push of a button. Unlike sippy cups, where flow is regulated by a valve, this is an actual drink mug that doesn’t spill, helping kids with their transition to cups. After trying the Contigo Westloop for myself, I was so glad to have the opportunity to share Contigo's great products with my kids... they each got a Contigo Kids Trekker Mug to test. 100% BPA FREE. Made with polypropylene (PP) #5. Patented AUTOSEAL® lid is 100% leak-proof and 100% spill-proof. Lid is also one piece, meaning no loose parts. Drinking made easy! Press to sip. Release to seal. 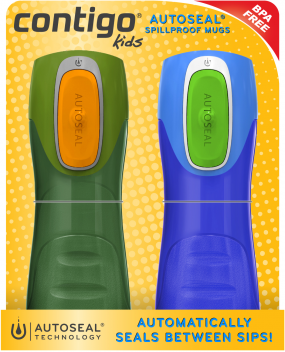 The AUTOSEAL® Kids Trekker Cup automatically seals between sips to ensure no spills. Easy-grip shape makes this kids cup easy to hold for smaller hands. Robyn is really taken with hers! She uses it everywhere and loves carrying it to school because it's more leak proof than her regular water bottles and so much more convenient - she can't lose the lid, doesn't need to unscrew or pull anything - just push the button and take a sip. Of course, she covets my Westloop because the trekker is strictly for cold beverages and she'd love to be able to take hot chocolate or tea to school, but the trekker has replaced her water bottle as the go to choice for water and juices. Liam sometimes has trouble with his because he's still so used to a straight sippy cup, but as we transition away from those completely, the trekker is definitely an asset! I really like that the Trekker is BPA free and really sturdy. Liam even dropped his from the top of the stairs and it survived none the worse for wear. They are definitely great for the car, for their backpacks and for outdoor use. They are also great for those 'sippy cup' situations. You can check out Contigo's entire line of products at http://www.gocontigo.com, keep up on Facebook or Twitter. And keep an eye out at retailers across the country! Disclaimer: I received this product for the purpose of completing my review. All opinions are my own.